If you enjoy authentic Mexican food then these Mexican Chicken Recipes will make your mouth water. Learning to cook new kinds of food is fun and expands your abilities in the kitchen. Do not worry if you make a mistake or two and definately experiment with different Mexican cooking spices to suit your tastes. Your family is sure to appreciate the new things that you make. Mexican recipe ingredients often include chili peppers, tomatoes and onions, along with garlic. Some other common ingredients include herbs and spices like black pepper, oregano, paprika, parsley, cumin, lime juice, salt, sugar and cilantro. Chicken Fajita Recipe Great Mexican Recipe for your next Mexican Theme party. They make a fun dinner idea for kids because they can build their own fajitas and if you're a health conscious mom like me then at least you know you're getting a few veggies into their diet. White Chicken Chili Recipe Delicious, basic White Chicken Chili Recipe. This is the best basic Chicken Chili to experiment with. You'll definately want to cook this chili dish for your family. The heat factor is really up to you. You can add extra chili powder, cayenne pepper (which also has amazing health benefits) and varieties of fresh chili. Chicken Tortilla Soup Recipe Your kids will love this Chicken Tortilla Soup recipe. It also makes a great dish for a Mexican theme party or a light supper or lunch time snack. Avo and Chicken Salad Recipe with Mixed Beans Try this super easy Mexican Chicken Salad Recipe with Beans and Avocado for a great lunchtime meal idea. Chicken Enchilada Recipe with Spicy Guacamole "Enchilada" (also known as taquitos), literally means to add chili pepper. In this chicken enchilada recipe the chili is in the guacamole so you can adjust the burn according to your liking. The crock pot is wonderful for cooking authentic Mexican Chicken recipes, especially the spicy ones that make your taste buds tingle. The slow cooking process brings out the flavors of every ingredient like the chillis and other strong spices and the finished dish will taste fantastic. When you are using chilies and strong flavored ingredients to make traditional Mexican foods, you will want the flavors to develop and combine, because the finished dish will taste amazing. Crock Pot Chicken Chili Try this Crock Pot Chicken Chili Recipe - chicken cooked in chili and beer for impressive flavour. 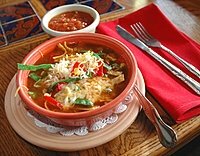 Crock Pot Chicken Tortilla Soup Recipe Try this spicy Mexican soup. Tortillas are perfect to have with your favourite soup. You can make your own tortillas or buy them. Tortillas are said to be the national bread of Mexico and is made from maize or corn flour. Although it would be quite nice, you don't have to go to Mexico to try authentic Mexican food.